Steven Lilako, No. 29, passes ball upfield to a teammate in the Lions' 1-0 overtime win over Northeastern State. 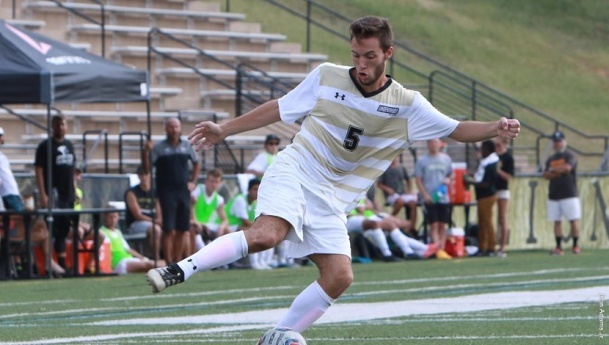 The Lindenwood men’s soccer team defeated MIAA conference opponent Northeastern State University by the score of 1-0 in overtime on Sunday afternoon at Harlen C. Hunter Stadium. Just 41 seconds into overtime midfielder Noah Savage crossed the ball into the box that was headed in by forward Steven Lilako past the Riverhawks’ goalie, winning the game for the Lions. While he was in the air, Lilako knew he was going to score. This was Lilako’s third goal in the last two games as he finishes the season with four goals on the year. Northeastern State outshot the Lions 10-9 during the game with Lindenwood having four shots on goal and the Riverhawks having three, according to Lindewood Athletics. Lions goalie Tim Licht had three saves on the afternoon, and with this shutout he finishes the year with five shutouts and a record of 9-3 in goal. Three players on Lindenwood were issued yellow cards during the game: Gabriel Jaimes, Lilako and Savage. With this win, Lindenwood finishes the season with a record of 10-7 and a record of 5-3 in the MIAA conference.